After 1,901 games, the most ever by a National Hockey League referee, Kerry Fraser retired after yesterday's game between the Flyers and the Rangers. 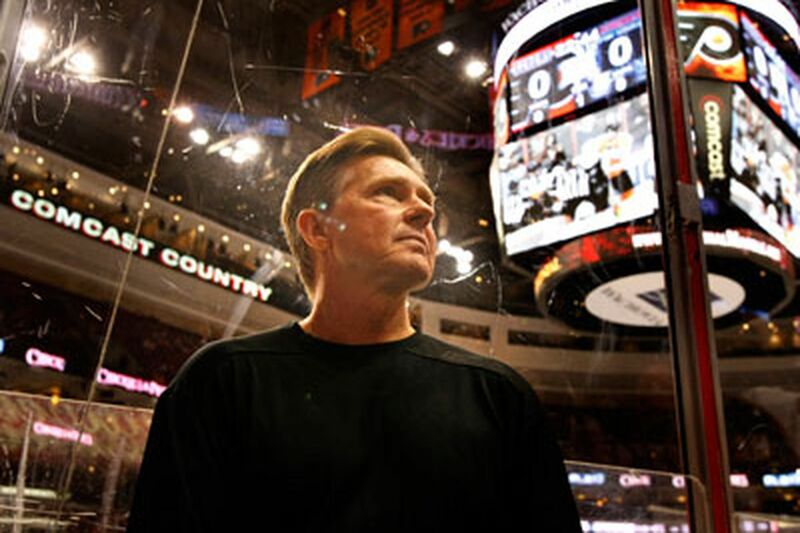 The man has worked a dozen Stanley Cup Final series, the World Cup of Hockey in 2004 and the Winter Olympics in 1998, but he had never been a part of anything like this: Flyers 2, Rangers 1, shootout, postseason on the line. "It was a Hollywood script," he said. "Games like that, somebody has to lose, unfortunately. Down to a shootout with the same teams, where one of them comes in [to the playoffs] and one of them goes home, I think that's the first time it's happened." The other three officials - referee Kelly Sutherland and linesmen Don Henderson and Darren Gibbs - all wore Fraser's familiar No. 2 jersey in his honor. Saturday night, they all had a barbecue at Fraser's South Jersey home. All season long, Fraser has received congratulations from teams and players. Yesterday, he received a text from Wayne Gretzky. Before the game, Fraser was joined on the ice by two of his grandchildren for a ceremonial puck drop. The ceremony was accompanied by a great ovation from the crowd at the Wachovia Center, with none of the booing that officials learn to expect. Since 1980, Fraser has always been different, though - starting with the years and years that he worked without a helmet, adding to his image and his recognizability. "In 1988, we moved here," Fraser said. "In 1987, I was given a medication by a Calgary Flames doctor that I had a horrible reaction to. I missed 6 months. My first game back here, I got a standing ovation. "The fans here are extremely knowledgeable. They're demanding, they're tough, they expect passion and that's a good thing. This market, for me, has always been an exciting place to work because they let you know when they thought you did something wrong and they were fair enough to let you know when they thought you did something right. There were so many people along the glass that tipped their hat to me." In the old days, the one-referee days, you knew what a Kerry Fraser game was going to be. He was going to call only enough to keep the game from getting out of hand. It was all about having a feel for the situation, and the implications. The league has changed in three decades, though. There are two referees now, and they are more about the letter-of-the-law now than in the past. In the third period yesterday, the Flyers tied the game on a power play after an interference penalty on the Rangers' P.A. Parenteau, a penalty that probably would not have been called when Fraser first started working. Still, it was a lightly-officiated game, as it should have been, given the enormity of the stakes for both teams. "The penalties that we called are a testament to the fact that the old style, the old way, is no more," Fraser said. "They commit the crime, they do the time. We didn't invent anything. We let them play. We let the emotions stay in the game. We didn't overcall the game. That can be as bad, in my opinion, as going out there and letting too much go, calling too much. There has to be that feel for the game . . .
"Each game has a heartbeat. If you take the heartbeat away right off the bat, it's over. It goes flat." Fraser said he uncertain about what he wants to do next, except that he already has found a publisher for the book he is writing. The working title: "The Final Call." And as for the final game, it was a fitting end. "It was all on the line," Kerry Fraser said. "We called what we had to call and we didn't get in their way."